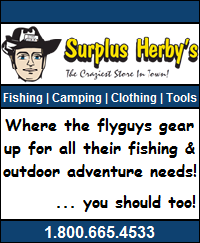 As you may have seen on our 2011 fishing reports post or the flyguys.net facebook page, this year we took a bit of time out of July to hit Prince Rupert for some fishing on the Pacific Ocean! What a blast! 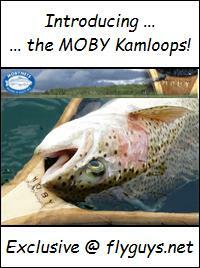 We were into Pink, Coho & Chinook (Spring) salmon, Rock Cod, Crabs and Halibut! 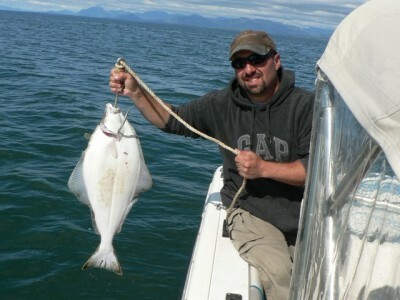 Now we have had some experience with salmon and the like but the halibut fishing was brand new to us and therefore so was how to deal with them in preparation for the oven or freezer. A quick lesson by a local expert soon cleared that up and were soon perfecting the technique ourselves! For those that are in the same boat as we were, here’s how to fillet a halibut! 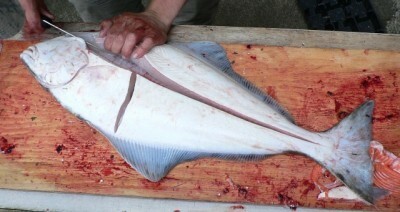 The method we were taught takes two (2) fillets of each side of the halibut for a total of four (4) per fish. The method also avoids the internal cavity and therefore enables the filleting to be accomplished with out the need of gutting. start at the tail ……. 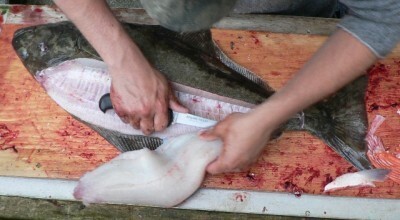 & cut following along the top side of the backbone towards the head. & now simply cut the top fillet away! 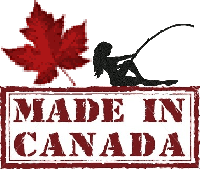 keep the knife blade close to the bone ……. & voila … fillet #1 done! 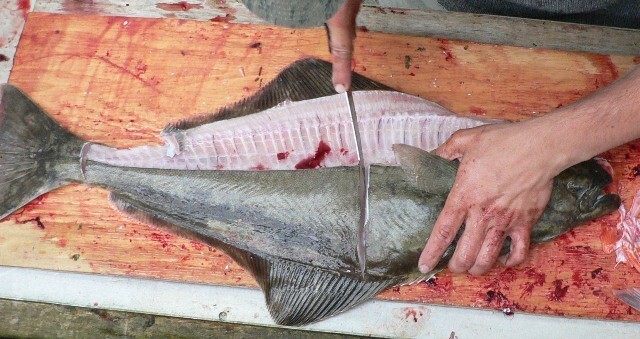 Before cutting out the second fillet use your fingers to determine where the stomach ends and then cut a line perpendicular to the backbone just downstream (towards the tail) of that point. … be careful cut as close as possible without nicking the stomach! & now cut out the second fillet ……. 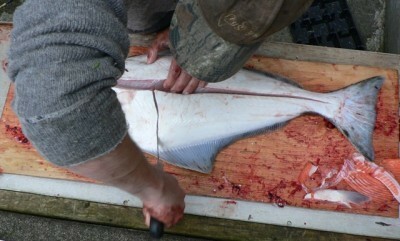 Flip the halibut over and remove fillets #3 & #4 exactly the same as you did #1 & #2! 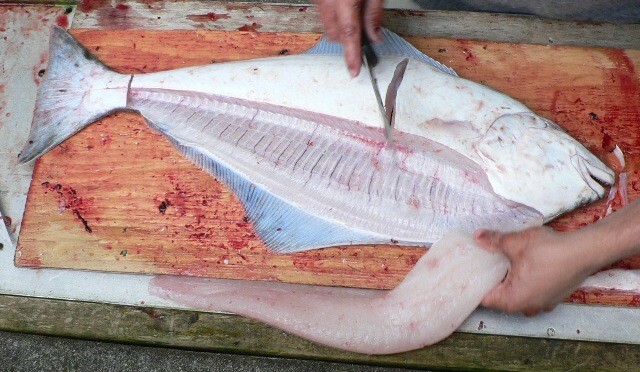 remove the top fillet ……. 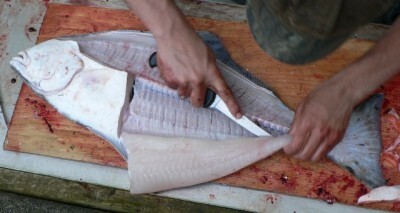 and remove the bottom fillet! But wait there’s more … these guys are so good that you don’t want to leave anything to waste and there’s two more small but extremely tender morsels that need to be removed – the cheeks! It’s as easy as ……. And that’s it folks … you’re done! 😀 Wrap and freeze or get the BBQ ready! This entry was posted in Fishing and tagged Fillet, Halibut. Bookmark the permalink.